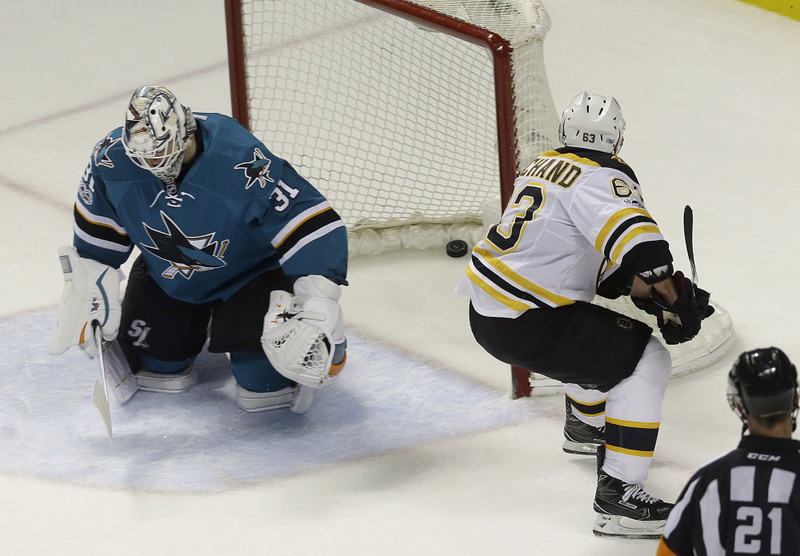 Sidney Crosby, Brad Marchand lead list of key players to watch in postseason. That’s a scary thought for the rest of the NHL. Crosby led the league with 44 goals, at least four more than anyone else, and had 89 points for his highest total in three years. He had 19 points in the postseason last year as Pittsburgh won the Stanley Cup for the second time in his career and first since 2009. “I think Sidney is playing the best hockey of his career,” Tampa Bay Lightning general manager Steve Yzerman said as the regular season wrapped up over the weekend. Crosby headlines a group of stars to watch as the playoffs open Wednesday night. Boston Bruins winger Brad Marchand is also on that list. Marchand was one of the best players last fall when he helped the Canadians win the World Cup of Hockey. He carried his strong play over to the NHL season with 85 points for Boston, at least 24 more than he’s had since making his NHL debut during the 2009-10 season. The 5-foot-9, 181-pound forward, who was suspended for the last two games for spearing, will lead the Bruins in their opening-round series Wednesday night at Ottawa. As for Crosby, Yzerman has a unique perspective on Crosby. Yzerman played against Crosby during the 2005-06 season, his last season with the Detroit Red Wings and Sid The Kid’s first in Pittsburgh. Yzerman picked him to play for Canada at the Olympics and Crosby led the way to gold medals in 2014 and 2010. Yzerman and the rest of the hockey world also watched Crosby take over last fall in the World Cup of Hockey to help the Canadians rally for gold. Yzerman helped Detroit hoist the Cup in consecutive years in 1997 and 1998, the last team to pull off the feat, and he believes Crosby can help the Penguins do it if they can stay healthy, starting with their first-round matchup against Columbus that begins Wednesday night. With the Red Wings relegated to watching the playoffs for the first time since 1990, Pittsburgh’s 11-year postseason streak is the longest active run in the league. The 20-year-old Edmonton center had an NHL-high 100 points to trail only Crosby and Wayne Gretzky as the youngest players in league history to win the Art Ross Trophy. McDavid, the youngest captain ever in the NHL, lifted the Oilers into the playoffs for the first time since they lost in the 2006 Stanley Cup Final. Edmonton has a first-round matchup with San Jose that starts Wednesday night at home. Toronto drafted the 19-year-old center No. 1 overall last summer, a year after McDavid was taken at the top of the draft, and surpassed high expectations. He tied for second in the NHL with 40 goals and led the Leafs into the playoffs for the first time since 2013 and for just the second time in a 12-year stretch. It won’t be easy to advance against the Washington Capitals, the NHL’s top-seeded team. Chicago’s superstar may have something to prove in the playoffs after being held to only one goal in a seven-game, first-round series the Blackhawks lost to St. Louis last season. Kane is coming off the second-highest scoring season of his career with 89 points going in Game 1 against Nashville on Thursday night at home. He had 23 points in the 2015 playoffs when he lifted Chicago to its third Stanley Cup in six seasons. Montreal made a bold move last summer, trading P.K. Subban to the Predators for Weber. It looks like the trade paid off for the Atlantic Division champions a year after they missed the playoffs. Weber hasn’t played since April 1, sitting out to give a lower-body injury time to heal, but he was on the ice with the Canadiens on Monday and appears to be ready to face the New York Rangers at home on Wednesday night. Like Marchand, the 5-10, 184-pound Minnesota center doesn’t let the lack of size stop him. He had a breakout season with 69 points, surpassing his previous career high by 25. Granlund will no longer fly under the radar if he can help the Wild get past the Blues in their first-round series that starts Wednesday night. The Pacific Division champion Anaheim Ducks hope their 23-year-old goaltender can bounce back from last year’s postseason appearance that lasted just two games because he was benched during a first-round exit against Nashville. Gibson is coming off a regular season in which he set career highs with 25 wins and six shutouts.